Founded in 1924, Tsurumi Manufacturing Co., Ltd. is a Japanese company that manufactures and sells a variety of pumps, environmental systems and related equipment. Their core products are submersible pumps. Besides liquid feed pumps, Tsurumi also deals in liquid ring vacuum pumps, which are widely used as vacuum sources in virtual every field of industry, noting first and foremost the manufacturing sector. This article focuses on Tsurumi's general-purpose vacuum pumps and introduces their VD- and VZ-series of lightweight, compact liquid ring vacuum pumps that offer users superior durability, high efficiency and low-vibration low-noise running. These vacuum pumps are predominantly used to make industrial chemicals, but they are also serving other fields of industry through applications in filtration and are widely deployed in the production of foods and beverages. Tsurumi's VD-series of lightweight, compact liquid ring vacuum pumps integrates the pump and motor into a monoblock configuration. The lineup comes in outputs of 0.4 to 5.5 kW, as well as a choice of cast iron or stainless steel construction. Owing to this monoblock structure, the shaft couplings do not need aligning prior to running these pumps. The shaft is sealed by a highly reliable mechanical seal that enhances the pump's durability and maintainability via an O-ring and other parts. Moreover, a ball valve mechanism built into the pump's discharge port enables highly efficient operation with minimal power loss, by stably maintaining suction capacity performance in the high vacuum range. 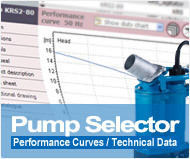 These features contribute to the pump's low-noise operation. For the motor, the VD-series uses a TEFC outdoor type, but explosion-proof and corrosion-resistant types are needed if the pumps are installed in atypical environments or atmospheres. In such case, Tsurumi offers a special specification VDC-series that directly couples the motor to the pump via a shaft coupling. Tsurumi's VZ-series of liquid ring vacuum pumps are high output versions of the general-purpose pumps of the VD-series, available in an output range of 5.5 to 30 kW. During the development process, the pumps went through repeated structural improvements that reduced weight and size. Additionally, liquid ring vacuum pumps require a regular supply of seal liquid while running, but the VZ-series reduces seal liquid consumption by 10%. Moreover, the VZ-series pumps employ the Cavitation Reducer that draws in small quantities of dry gas from the outside to reduce cavitation that can occur with liquid ring vacuum pumps in the high vacuum range, should the seal liquid begin to boil because of the high vacuum. * Includes the mass of the IE3 TEFC (Outdoor) type motor. The liquid ring vacuum pumps of both Tsurumi's VD- and VZ-series come with stainless steel impellers and port plates as standard features that enhance the pump's overall corrosion resistance and durability. As an option, an all stainless steel pump can also be manufactured. Tsurumi also offers, as a special accessory, a separator tank that collects and separates drained suction gas and seal liquid. Moreover, for users who want to recirculate the seal liquid, there are the VDP- and VZP-series that, as upgraded models of the VD- and VZ-series, incorporate a makeup water tank for holding the seal liquid on a common base with the pump and motor. In addition, a heat exchanger is available for preventing any undesirable rises in temperature of the circulating seal liquid. Besides the liquid ring vacuum pumps, Tsurumi also offers liquid ring compressors for pumping gases and diverse vacuum pumps for condenser extraction for power plants, therefore if interested, contact Tsurumi for more information and a quote.